If your kids are anything like mine, you go through bandages like crazy. 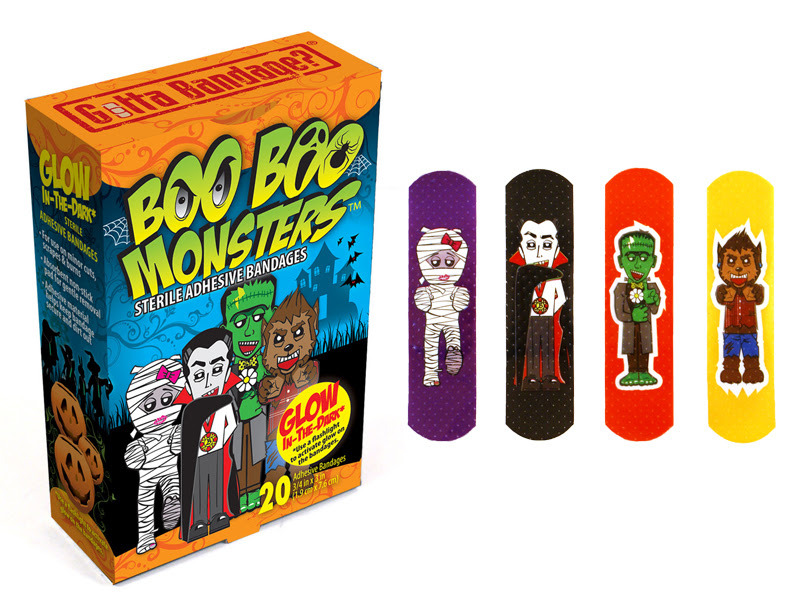 This Halloween why not let the kids use some fun with the Boo Boo Monster Gang! Watch their eyes light up when they find out they even glow in the dark! Are you used to creepy, gory monsters that give you the heebie-jeebies & frighten the daylights out of your kids? Fear not, because Boo Boo Monsters are here! Cover up cuts & scrapes while making new friends. A modern spin on classics, Boo Boo Monsters are cute, approachable & fun-loving… anything but scary. Wear them all, watch them GLOW & have fun! Count Buckula: Often mistaken for a vampire, Count Buckula is really just a mysteriously pale dude with buckteeth, who wears a cape and medallion for that “wow” factor. He does it for the ladies… and they swoon. François Stein: Like the smooth French gentleman that he is, François Stein always comes proper and has extremely good manners. Some think his scar is frightful, but we think it adds to his charm. Miss Mum: Hailing from the UK, Miss Mum loves to walk with outstretched arms. Don’t be alarmed, she just wants to show you her manicure & give you a big hug! Wolfgang: Have you ever seen a cuter werewolf with a cooler outfit? We think not. If he looks a bit frazzled & upset, it’s only because his mom woke him up from his afternoon nap. These bandages didn't last long in your house, the kids couldn't get enough of the cute spooky characters. Wolfgang is my favorite. My favorite Trick-or-Treating story is taking an exchange student with us who was fascinated with doorbells. My favorite Boo Boo Monster is Count Buckula. I love the black color and he is so handsome. My favorite trick or treating experience was when my kids were smaller we all dressed up as different crayon colors including the grandparents and walked around. It was really fun. Now they prefer scarier costumes. My favorite is Miss Mum! Us girls need to stick together more! My favorite trick or treat story - is just that my son who was 5, would not help hand out candy for Halloween. He just kept putting it in his pocket! I love the Francois Stein one and I remember taking my nephew trick or treating for the first time a few years ago. He was so confused, but so excited about people giving him candy! I like miss mum band aids. My favorite bandage is Miss Mum. My favorite memory is going as Little Bo Peep and having my sisters put on tons of cotton balls and playing my sheep. I love the Mummy bandage. My favorite Halloween Story is The Legend of Sleepy Hollow.